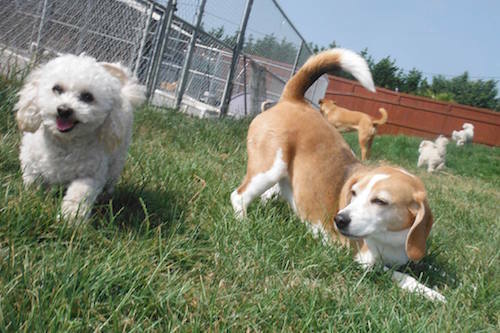 Experts agree that one of the best outlets for all that doggie energy is playing with other dogs. Dog Day Care is available at Two Rock Dog Ranch on a “drop-in” basis Monday through Saturday; all health requirements must be current (vaccinations and giardia lab results). There is no day care on Sunday. All dogs are required to pass our mandatory evaluation before attending day care. Your dog will enjoy an active day without spending a moment alone – and you’ll come home to a calm, relaxed dog! Running, exploring, relaxing and lots of friends! Doggie Day Care is an outstanding way for your puppy or shy dog to gain socialization experience, become more confident and learn canine manners – all in a supervised and safe environment. Dogs are accompanied by handlers at all times. Laid-back dogs and senior canines explore the grounds at their own pace. 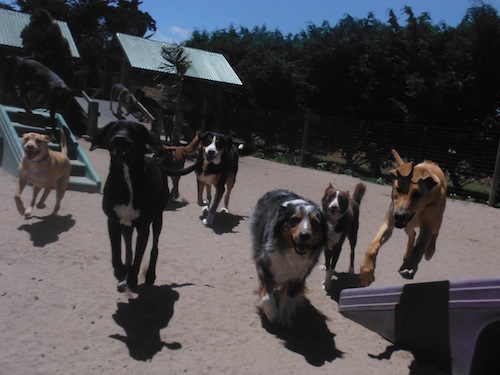 High-energy dogs get plenty of exercise in our large fenced yards. Special indoor activities on rainy days.